A charge of ‘drunk driving’ - DWI (driving while intoxicated) or DUI (driving under the influence) - is considered to be a serious traffic violation in the State of New Jersey. In addition to DUI or DWI, the act of refusing to take a breathalyzer test (a test that measures alcohol content in your system) if requested by a law enforcement officer is also considered to be a major New Jersey traffic offense. As you probably realize, a conviction of DWI / DUI or the act of refusing a breathalyzer test carries penalties with lifelong implications that can negatively impact your career, reputation and many other aspects of your life. When faced with such a serious charge, you should seek qualified, experienced counsel. Victor Rotolo is not only an experienced attorney, but he is also a former police officer for the City of Elizabeth. 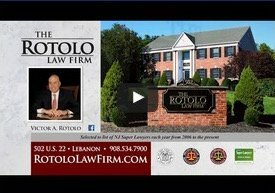 The experience of being both a police officer as well as an attorney affords Mr. Rotolo a well-rounded perspective when representing clients facing charges for DWI or DUI. Pursuant to New Jersey Law (Statute N.J.S.A. 39:4-50), a person may not operate a vehicle if the person is “under the influence of any intoxicating liquor, narcotic, hallucinogenic or habit producing drug.” If a person’s blood alcohol content (BAC) is at or above 0.08%, the person is considered intoxicated; according to the NJ Statute that person is not allowed to operate a motor vehicle. In addition to stipulating that a person ‘under the influence’ cannot operate a motor vehicle, the Law also prohibits a person from knowingly allowing another person under the influence to operate a motor vehicle as well. The penalties for violating the New Jersey Laws regarding DWI or DUI are severe and include fines, community service, loss or suspension of a driver’s license, and jail time. The severity of the penalty is dependent on the number of times a person has been convicted of DWI or DUI. First the State must prove that the individual was intoxicated or under the influence of a drug. Per the New Jersey Law, this means the individual exhibited a "substantial deterioration or diminution of the mental faculties or physical capabilities" as a result of the use of drugs or alcohol. When the State is unsuccessful in establishing intoxication through a breath test or through the blood, information from a field sobriety test administered by police officers may be introduced as evidence. Quite often these tests are subject to scrutiny because the field sobriety test may have been improperly administered and / or because the results are based on subjective interpretation. In addition to the consumption of alcohol, a DUI summons may be based on the ingestion of illegal drugs. However, in order to present viable evidence to support the conviction of the use of illegal drugs, the State is required to present evidence gathered by a police officer that is certified in this area. Such police officers are certified as DRE, which is a Drug Recognition Expert. Results of urine or blood tests are also required to prove the person did have drugs present in his or her system. Once it is determined that a person is under the influence of alcohol or drugs, the State of New Jersey is then obligated to prove that the person operated a motor vehicle in that condition. This requirement of ‘operation’ is generally established by actual observation by a police officer, but ‘operation’ of a motor vehicle can be established by circumstantial evidence as well. Furthermore, the State of New Jersey is not required to prove actual physical movement of the vehicle in order to meet the ‘operation’ criteria; it only has to prove that the individual intended to operate the vehicle and that the vehicle was capable of being operated. As examples, evidence such as a person sitting in a vehicle with the keys in the ignition or a person sitting in a ‘running’ vehicle even if the vehicle is not moving may be presented as possible proof to meet the State’s “intent” requirement for ‘operation’ of a vehicle. There are numerous defenses to the charges of DWI or DUI in New Jersey. Mr. Rotolo and the attorneys at Rotolo Karch Law have consistently provided their clients with a well-investigated and prepared defense to their situation and work to minimize the impact that such charges can have on one’s life. Please call Rotolo Karch Law today if you are facing such serious charges.